The Khronos Group have used the GDC to launch the latest version of the OpenGL specification - and it brings some impressive new features to the table. 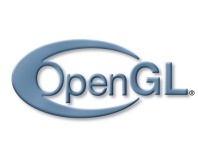 As reported over on Ars Technica, perhaps the most important thing to note about OpenGL 4 is that it brings the open standard's features to the same level as Microsoft's closed Direct3D 11 - promising top-quality visuals for games that implement it. The two main functions added to the OpenGL standard in this revision are hardware tessellation - the ability to programmatically synthesise polygons for far more realistic curves - and compute shaders - key to the offloading of computation tasks to the GPU, as in GPGPU computing. 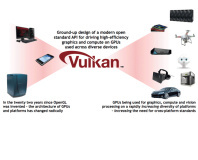 While the Khronos Group have supported GPGPU via their OpenCL specification, the new compute shaders support in OpenGL 4 allows that technology to be integrated directly into the graphics engine - making it easier for developers to implement. Sadly, many of the advanced features that the Khronos Group promised for OpenGL 3 - dropped due to time constraints and complaints about lack of backwards compatibility - are still missing from the specification: game developers will be saddened to hear that the object-oriented API - designed to mirror that used by Direct3D - still hasn't made an appearance. While cards supporting OpenGL 4 are currently thin on the ground, Nvidia has pledged support in its up-coming Fermi cards, and while rival ATI has yet to comment it'd be foolish for it not to match Nvidia's pledge - and the news isn't all bad for those still running on older hardware, with the Khronos Group havng also announced OpenGL 3.3, which aims to bring as many features of OpenGL 4 as possible to older hardware platforms. If you want to hear about OpenGL 4 straight from the horse's mouth, V3.co.uk has a video interview with the Khronos Group from the GDC. Are you pleased to see the cross-platform OpenGL standard getting even with Direct3D, or should games developers - and graphics card manufacturers - be concentrating on Microsoft's platform first and foremost? Share your thoughts over in the forums.